People sometimes tell me that, since they can't sew or don't have a machine, they can't make a costume. 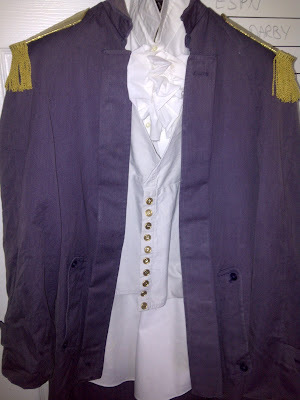 Well, this post proves that you don't have to sew to make a great costume! 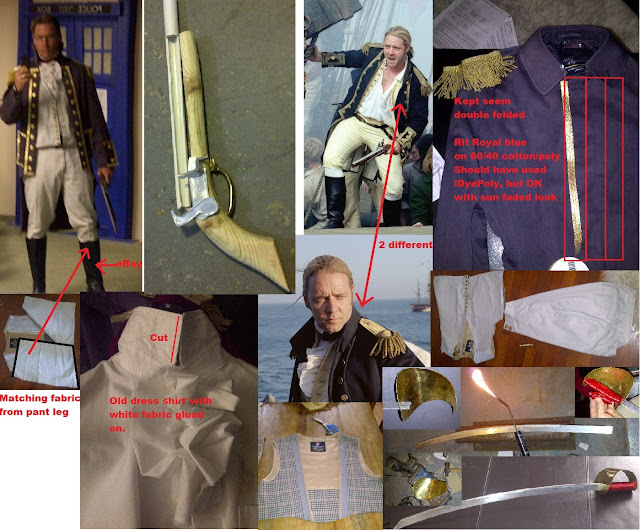 JoeRanger, the creator of this costume, contacted me a few weeks ago to let me know that he had made a Jack Aubrey costume like mine for a party, only he did it with no sewing! 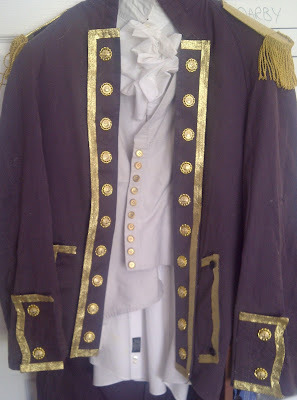 I was impressed and asked if I could post about it here to give some ideas to others who might want to make a costume without having to sew. He said yes and sent me these photos. 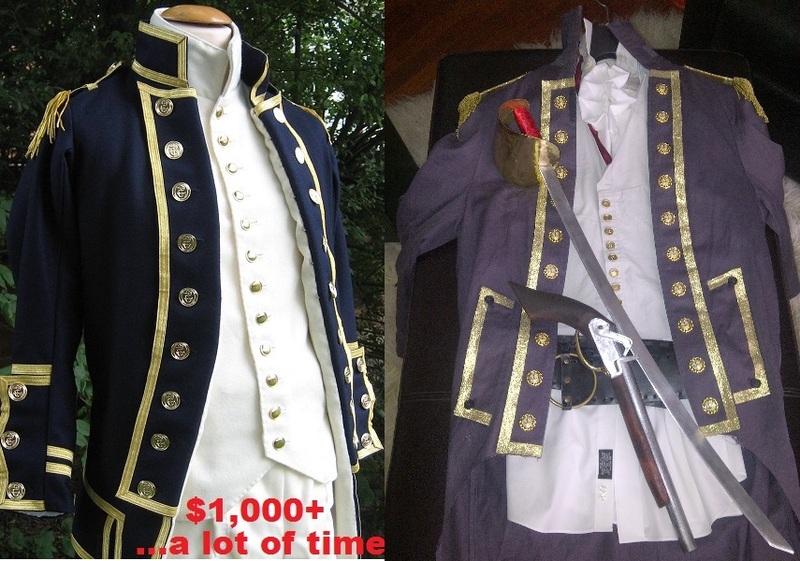 Left: A reproduction Royal Navy uniform from DeborahLoughCostumes on Etsy. Right: JoeRanger's uniform and accessories. 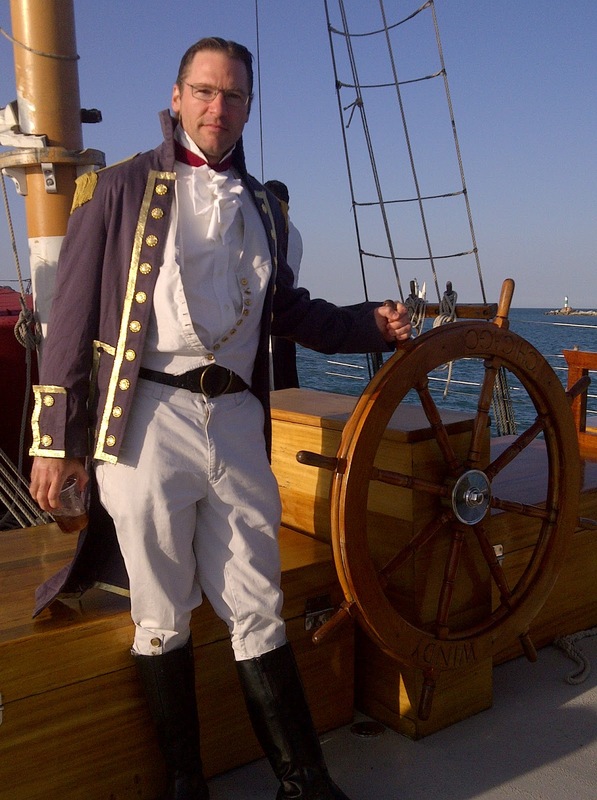 It's not easy to find an inexpensive Royal Navy costume online. Most of them for sale out there are historically accurate reproduction uniforms meant for films or reenactors and cost thousands of dollars. I have a feeling that's way above the budget of most people who find this blog, who are looking for something inexpensive they can wear for a party, Halloween, a convention, etc. Most of the supplies JoeRanger used were scrap, thrifted or purchased on eBay; in total it looks like it cost him around $50. 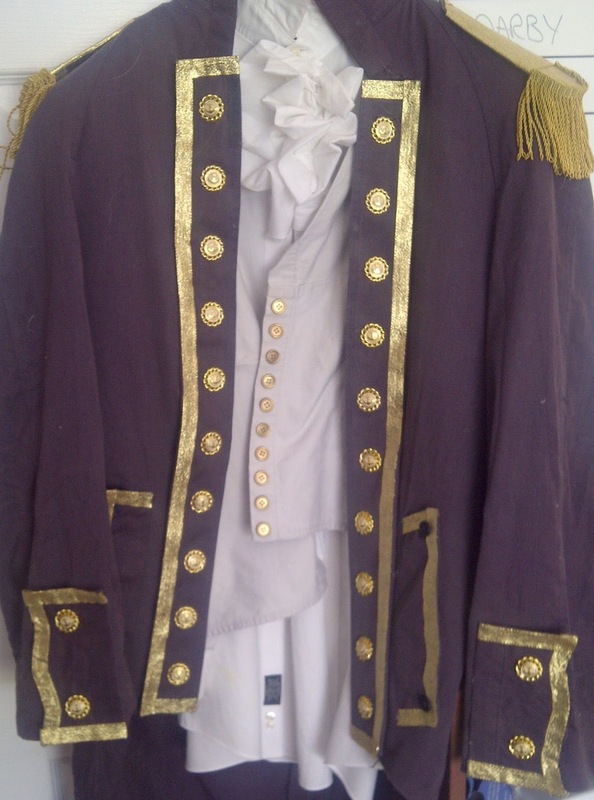 For Jack's uniform coat, he started with a 60/40 cotton/polyester tan trench coat ($9) and dyed it a dark royal blue with Rit liquid dye. He cut the trench coat to match the shape of Jack's coat which meant cutting away the lower front parts of the coat. I believe he folded the raw edges inside and glued them together with hot glue. 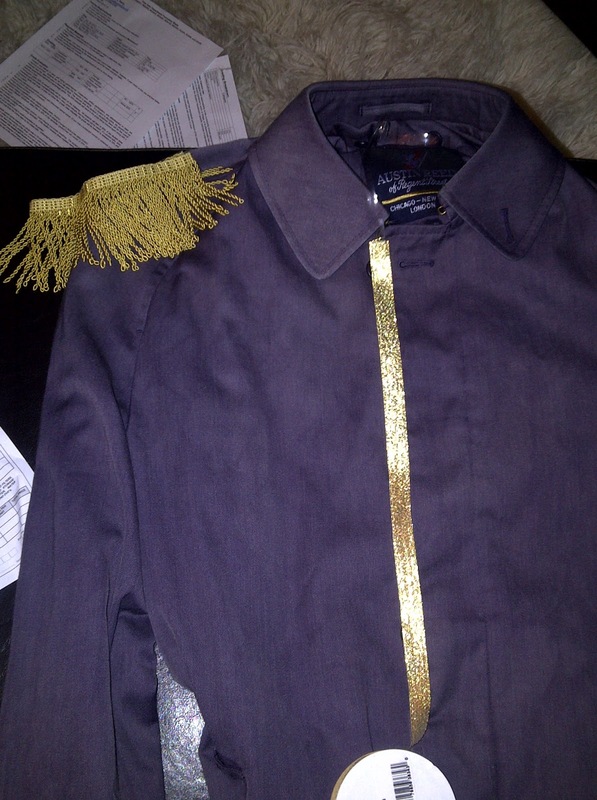 The trim and buttons (plastic with anchors; $5 from eBay) were glued on as well. An alternative would be to use iron-on fusible tape to finish the edges, which could also be used to attach the gold ribbon trim. For the pants, he found a pair of khaki pants for $4. 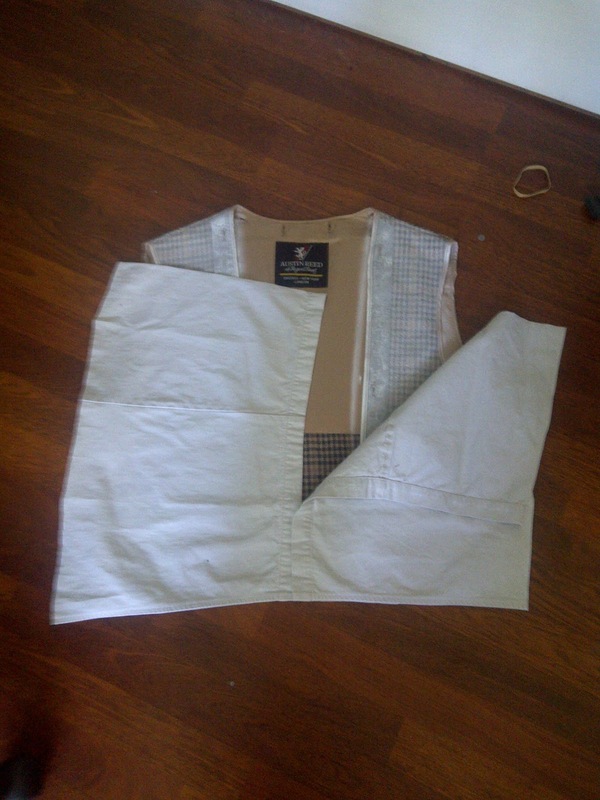 He cut them off at the knee and used the extra to alter the liner that came with the trench coat so it looks like Jack's vest. 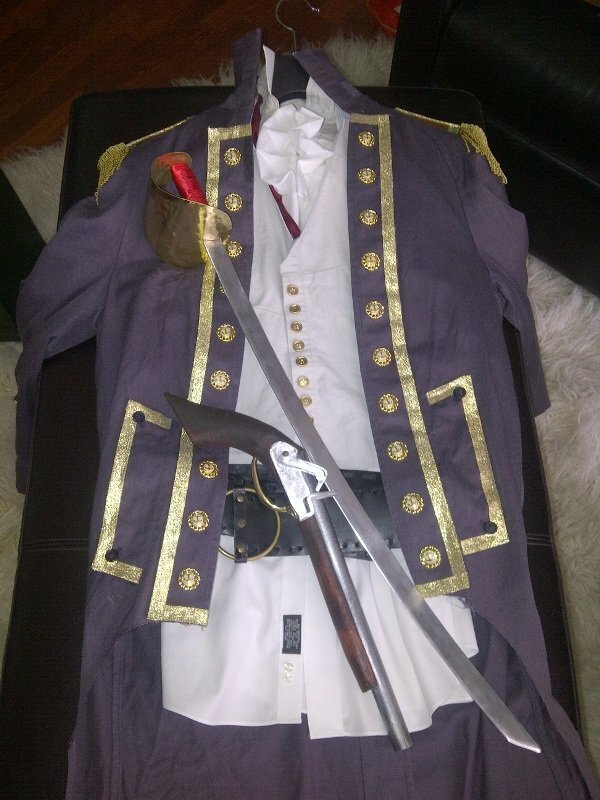 The shirt was an old dress shirt with fabric glued on the front, the boots were left over from a Han Solo costume ($30 on eBay) and he constructed the pistol and sword from scrap in his workshop. Thanks for sharing, JoeRanger! 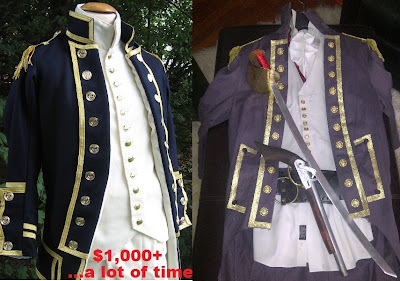 I hope that these photos are enough to show those of you out there who want a Jack Aubrey costume that, if you're willing to get creative and put in some effort, you can find a way to make an inexpensive costume without having to sew.